Cook, Serve, Delicious! 2!! is the massive sequel to the surprise best selling original, one of the few games that gives players complete control on how they want to build their restaurant. The game has you rebuilding your own restaurant in a massive skyscraper, earning money by cooking and serving customers delicious food and building up your restaurant’s reputation from a zero star dilapidated café to a five star world famous restaurant. Along the way you’ll jump into other restaurants in the tower for shift work, star in the biggest reality cooking show ever, participate in tournaments all over the world, uncover mysterious ingredients, and tons, tons more. The breakneck pace and gameplay has been a staple of the game, and this sequel will be even faster and more challenging than ever. 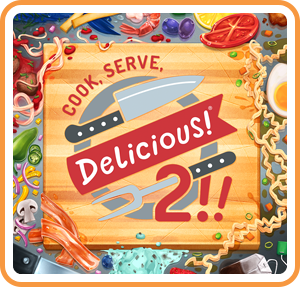 Where can I buy Cook, Serve, Delicious! 2!! physical/digital?